Taptap lets you access your applications, files and data at any time. • Application: This is where you set the settings and parameters. • A process in the background: It opens the access window with a double-tapon the Command key (or the shortcut you've chosen). Note: You do not need to keep open TapTap to access your data. - The immediate access at any time and from any application. - The possibility to add descriptions and keywords to applications, to find them more easily or to classify them by type (eg all your applications that you can use for your iPhone). - The presence of a disk browser, and contextual menus displaying the contents of folders and allowing easy access to files and contents. - Managing notes protected by a password to access very quickly to your personal data or those you need regularly. 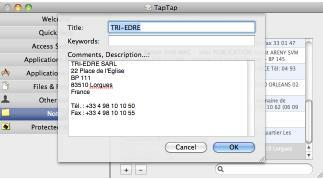 TapTap application contains different panels to define the settings: folders containing the applications, files and folders, bookmarks and Address Book entries to include in the search, etc. Note: You can add comments and description to any application, to retreive it easily. This is specially useful for applications with a name that does not describe its function, or for applications that you use frequently, or dedicated to specific uses (you can set a special keyword for applications related to your iPhone, for example). It is also in the main application that you create and edit notes notes (text accessible at any time) and notes protected by a password. These notes can be accessed for consultation and the contents copied. This is a good place for informations that you regularly need. 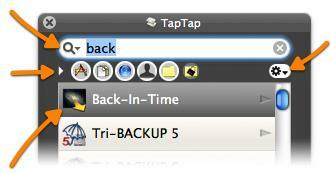 The TapTap process can be accessed at any time with the shortcut that you have chosen. Its window appears at the top of all windows and shows the items filtered with the characters you enter. You can enter multiple words separated by a space. For example, enter "uti dis" to find Disk Utility. - Press the Return key to open or launch the selected item, or open the URL, or copy the text of the selected address or note. - Reveal item in the Finder (if it's a file, folder or application). - Open the contextual menu (Control-Click) for other operation, access the contents and subfolders of a folder, etc. You can also open a browser to navigate inside a folder's contents. Smart access with the most recently used items at the beginning of the list. Launch applications or reveal in the Finder. Possibility to add description and keywords to applications for an easier search and access. Possibility to copy all or part of the path (files and applications), addresses, URLs, notes, etc. Search in all items, or limited to a particular type. Notes (for a quick access to information that you use and copy regularly). A trial version is available for evaluation. It is fully functional but is time-limited. Universal binary for Intel and PowerPC Macs with Mac OS X 10.5 or higher.